All of the dogs at the rescue had extra treats and toys thanks to all our supporters donations. Thank you also for the people involved in the Love Whitby moonlight walk over the Christmas period who donated £110 from their walk to the dogs- cheers! Firstly a big thank you to Amy - we are so grateful for all the presents you brought in for the dogs at the rescue this Christmas - much appreciated. 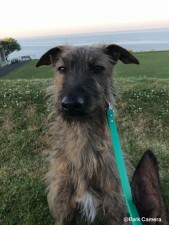 UPDATE 17 December 2018 - Four becomes 5 - as we now have another lurcher boy - 3 year old Steve pic below - who joins Flint, Big Boy, Bullet and Bobbie. 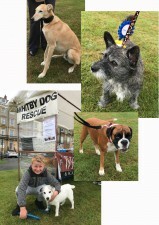 We have four gorgeous hound boys that desperately need new homes. Bullet, Flint and the gorgeous Big Boy have all been with us for many months and now they have been joined by the the very dapper red Billy. We know big lurcher type boys are not everyones cup of tea and you really need to be familiar with lurcher behaviour and nature but they can be the most rewarding and loyal of dogs. Please let anyone you know who may be on the look out for a lurcher, that we have four stunning and friendly boys just buzzing for a new home- Thanks. Please call Bob 01947 810787. Update 29th July 2018 - Here come the boys! 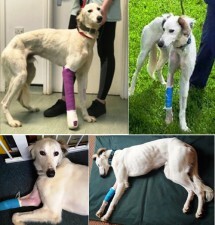 We have 3 of the most handsome and charming lurchers needing new homes. The boys all get along with the other dogs ( doubt they will get along with cats though!) - Big Boy is exactly that - he is a stunning greyhound cross with the fastest wagging tail. Bullet is an adorable soul always happy to see you. Finally we have 8 momth old Flint - he is very gregarious and will make a great companion- he will be quite big too! Lurchers are best with people who are used to big dogs - they do have bursts of energy but also like to be lazy lounge boys. Please call Bob for further information 01947 810787. Stall cancelled- sorry but we have had to cancel our stall today at Whitby Dock End as it is just too windy - the stall would have blown away - so we though it best to cancel for safety reasons- please come and see us on Regatta Sunday at Crescent Gardens or at Egton Show- Sorry about this. July 16th 2018 Update - Puppy Alert!!!! We have two lovely 8 month olds looking for new homes - Bebe is a beautiful friendly cross terrier girl and Flint is a gorgeous friendly lurcher - he loves to play - please see the We Need A Home section. If you want further information please call Bob on 01947 810787 - Thank You! We are looking for a forever home for Shadow. Shadow has his final post op checks and castration at the end of May after which he will be ready for his new home. 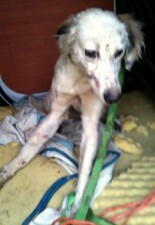 Shadow is a gorgeous young saluki (possibly a cross but he is predominantly saluki) who is looking for a new home. Shadow was brought into us in April with multiple injuries and thanks to the generosity of all our supporters and the unwavering help from Beck vets, Shadow is well on his way to a full recovery after his specialist surgery on his broken leg. Shadow shows all signs of once being a working dog and has a very keen instinct so we need a home where the people are used to salukis/ lurchers. Cats and small animals are definitely out. Shadow is sociable with other dogs and is an absolute charmer with people - he is very gregarious. It is not advisable to let these dogs run in public places as they have a mind of their own and will not come back if they do not want to - so an enclosed area for exercise is needed- fencing needs to be at least 6 feet high. Shadow will make a very fulfilling companion and deserves a loving home. If you think you can help please call Bob on 01947 810787 - thank you. 23rd May 2018 Shadow "Thats Yorkshire North TV"
For any enquiries regarding fundraising, donations, events or other general information please contact us as shown. Thanks to all your generosity enough money has been raised for Shadows operation! Shawdow went to Leeds today and has undergone surgery which went well. Sue Beck from The Beck Veterinary Practice is picking him up tomorrow and taking him home to look after him for the first part of his recouperation so we are very secure in the knowledge he is getting the best treatment. Shadow seems to win over everyone he meets as he has such a lovely nature - Many Thanks for all of your help! Early in the morning on 5th April Shadow was delivered into our care - this poor little fellow had an injured leg and a smashed jaw. We took him to Beck's vets who immediately made him comfortable and stable and have continued to care for him round the clock. Beck's very generously, have set up a Just Giving campaign to help us raise funds to save Shadows leg as he would be best getting speacialist treatment which cannot be done in Whitby. Please take a look at their page and share the link with all your friends. Many Thanks! 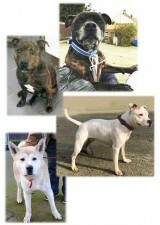 We have 5 gorgeous boys who have all been with us for quite a long time and really need new homes. It is always a very difficult decision to take in a rescue dog and it takes a very special person to do this. Our dogs come in all shapes and sizes and inevitably some are easier to rehome than others. We are very grateful to everyone who has cared for a rescue dog whatever the type but we are desperately seeking homes for some of the big specialist dogs that we have in the rescue. Hatchi is a gorgeous Akita who has been with us since early 2016. Samson is an Akita cross GSD. 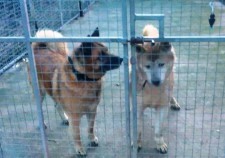 Both of these boys are sociable (away from food in Samsons case) but need strong owners who are used to the breed. Trek, Kevin and Jez are lurchers who again need homes with experienced owners. Kevin is a gorgeous, friendly chap who has been with us since mid 2016 – we cannot fault Kevin but because of his size he needs lots of exercise so we have not yet found the right home. Jez is a medium sized lurcher and for whatever reason he seems to be continually overlooked but he does deserve a loving home- we have had Jez since October 2016. Trek is a large greyhound who needs a home without any small dogs or cats- we think Trek has been a working dog and may be best suited to a working environment. If you want further information on these boys please call Bob on 01947 810787 – we would be very grateful for any enquiries. Thank you! 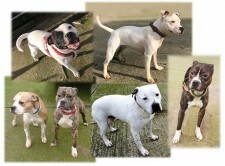 We have some lovely staffies in at the moment who all deserve loving homes. Colin is a gorgeous young small staffie with loads of personality. 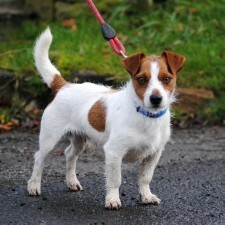 Buddy is such a handsome, sociable chap – he is only 2 years old. Hector and Mike are both mid size brindle staffies around 4-5 years old – great chaps. 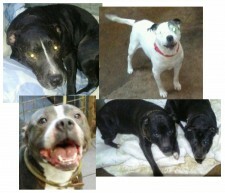 If you can help to save our staffies please call Bob on 01947 810787- Thank you! We have a great new staffie boy in this week from the dog warden- Hector- he is 5 years old and very sociable. Hector joins Mike and Poppy who have both been with us since earlier this year. All three have different personalities but all three would make great pets with the right owners. Hatchi is coming up to nearly 2 years in the rescue- he really would benefit from a new home so if anyone who is used to the breed (Akita) and has time to spend with him comes along we would be so grateful - he is a lovely chap and deserves his own home. Thanks - please call Bob for any further information 01947 810787. Nat has been at the rescue for a few years now and has made great friends with some of Bobs own dogs. Nat much prefers dog company to human company so we have decided to keep Nat permanently - so he will remain part of the furniture so to speak and is no longer avaiable for adoption but can still be seen guarding his territory with his pals at the rescue! Unfortunately we are not legally allowed to take in stray dogs off the street. Firstly, check if it has any identification which may allow you to contact the owner to return it. If not, walk around the neighbourhood asking if anyone recognises the dog and may know where it comes from. If you are unable to find the owner you should contact the Scarborough council dog warden during normal office hours (8.30-5.00, Mon-Fri) on 01723 232535 or outside office hours on 01723 351558.
they are due to be destroyed. We also take dogs from private homes which cannot care for them any longer. We cover the Whitby-Scarborough-Bridlington-Pickering-Malton area.